Roadworks on westbound Craig Road make accessing Craig Road Animal Hospital harder than usual. 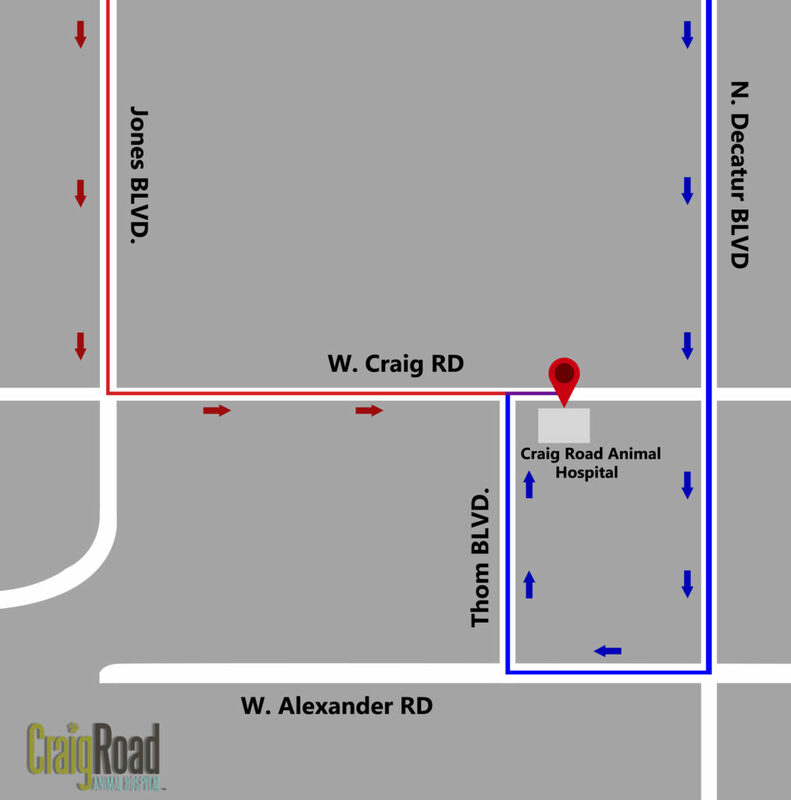 The opening that allows for turning on to Thom Blvd, and a U-turn on Craig Road into the Craig Road Animal Hospital parking lot, is currently closed. Westbound Craig Road is also reduced to a single lane for a significant distance. Eastbound Craig Road is currently not affected. To avoid driving on westbound Craig Road we suggest two different routes to access our parking lot. Drive southbound on Decatur Blvd past Craig Road. Turn right on Alexander Blvd., then right on Thom Blvd, and right again on to eastbound Craig Road. Alternatively; Drive southbound on Jones Blvd and then turn left onto eastbound Craig Road. We do NOT recommend driving westbound on Craig Road and then performing a U-turn at the Jones Blvd. Junction. Westbound Craig Road is reduced to a single lane, causing delays, and this also makes the U-turn difficult. Craig Road Animal Hospital Externship Program: Jenny!